(Eastlake, OH) - The Lake County Captains (29-38, 58-79) could have counted themselves out over and over again on Saturday night. Lake County trailed 7-0 in the fifth, 9-3 in the eighth and 9-5 in the ninth against the Lansing Lugnuts (37-31, 81-58). Somehow, the Captains came all the way back and Miguel Eladio provided the final heroics with a walk-off, two-run home run to give the Captains a 10-9 victory in front of a raucous crowd of 5,994 at Classic Park. 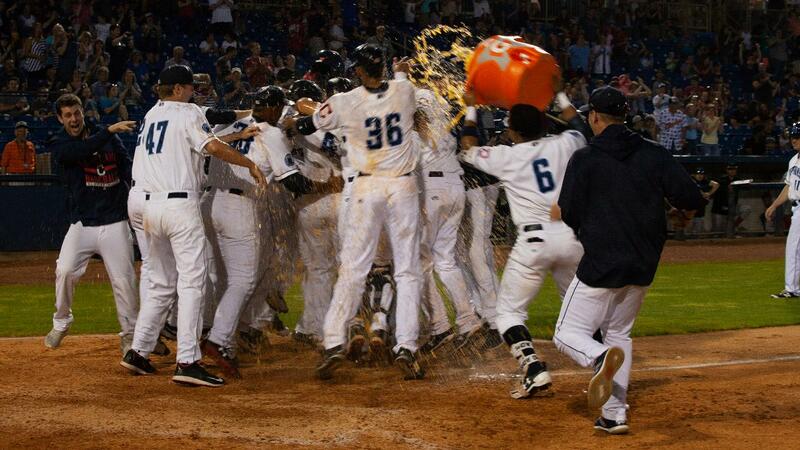 The victory gave the Captains 11 walk-off wins for the season. Shaky defense put the Captains behind the eight ball. The Captains committed six errors in the ballgame and the Lugnuts jumped on those miscues to score seven runs between the fourth and fifth innings. In the fourth, Ryan Gold keyed a two-out rally with a single and Reggie Pruitt followed with a double to right. Gold was content to stop at third, but Tre' Gantt's throw to the infield skipped away and Gold trotted home, while Pruitt advanced to third. Captains starter Felix Tati then walked eight-hitter Bryan Lizardo and Jesus Navarro followed with a single that scored Pruitt to give the Lugnuts a 2-0 lead. Lake County made three more errors in the fifth and Lansing scored five runs on just one hit. Tati walked Norberto Obeso, Chavez Young and Ryan Noda to start the inning. Brandon Grudzielanek came up with the bases loaded and nobody out and hit a grounder to second that could have been a double play ball, but it hopped up and hit Jhan Rodriguez in the chest for an error and Obeso scored from third. Gold came up next and hit a sacrifice fly to center to score Young and push the lead to 4-0. With Pruitt at the plate, the Lugnuts executed a double steal. Noda swiped third and Grudzielanek took second. Pruitt then hit a screaming line drive at Rodriguez and the ball glanced off the second baseman's glove for a single. Noda scored and Grudzielanedk advanced to third as the ball rolled into shallow centerfield. The nightmare fifth inning continued after Tati struck out Lizardo and was lifted for reliever Maiker Manzanillo . Pruitt was on second after stealing during the Lizardo at-bat and, with two outs, Manzanillo walked Navarro to load the bases. Samad Taylor came up and hit a bouncing ball to the right side. First baseman Mitch Reeves tried to make a backhand play, but the ball tipped off his glove. Reeves went to recover and threw off balance to first, but the throw sailed into the Captains' dugout. Grudzielanek and Pruitt both scored on the double error to give Lansing a 7-0 lead. The Captains relied on their resident slugger to put them on the board for the first time. Will Benson came into Saturday's contest with homers in back-to-back games and tied for the league lead with 20 long balls. After Dane Hutcheon and Jonathan Laureano began the sixth inning with back-to-back singles off of reliever Dany Jimenez, Benson connected again. Benson blasted a three-run home run over the right field wall for his 21st of the year and his third game in a row with a homer. The clout cut the Lugnuts' lead to 7-3. Lansing added insurance runs in the seventh and eighth. Gold led off with a single and Pruitt sacrificed bunted him to second. Lizardo then came through with a single to bring in Gold and extend Lansing's advantage to 8-3. In the eighth, Obeso led off with a single, but was erased on a force out when Young grounded to first and Reeves flipped to Eladio at second. Young was still on first later in the frame when Jordan Scheftz came in to relieve Manzanillo. The new right-hander walked Grudzielanek and Gold delivered another single, his fourth of the game, to drive in Young and make it 9-3. The Captains roared back in the last two innings. Jesse Berardi began the eighth-inning rally with a one-out single against Dalton Rodriguez and Reeves belted a drive to center. The ball sailed over Pruitt's head and bounced against the wall, as Berardi scored from first and Reeves chugged to third with a triple. A wild pitch then scored Reeves to trim the Lugnuts' lead to 9-5. Lake County was still down by four going into the bottom of the ninth. With Rodriguez back on the mound, Laureano hit a one-out single through the left side to bring Benson back to the plate. Once again, Benson connected. He hit a towering fly ball that landed just over the right field wall for a two-run home run. Benson's 22nd homer of the year and fourth in three days cut Lansing's advantage to 9-7. The Captains still needed to put another man on to bring the tying run to the plate, but Rodriguez got Berardi to ground out to second for out number two. Reeves then kept the game alive with a double to left-center and the Captains called on Jose Vicente to pinch-hit for Gantt. Vicente delivered with a line drive back up the middle and Reeves scored to make it a one-run ballgame. That brought Eladio to the plate. The Captains' shortstop went homerless until August 21 and only had two long balls to his name in 2018. Rodriguez quickly got ahead of Eladio with one ball and two strikes. On the 1-2 pitch, however, Eladio cracked a high and deep drive to left. The ball finally came down in the back row of the left field bleachers to give the Captains an improbable walk-off victory. The Captains poured out of the dugout to mob Eladio at the plate after the biggest comeback of the season and the team's 11th walk-off win. Scheftz (1-0) picked up the win in relief. The right-hander pitched 1.1 innings of scoreless baseball and allowed just one hit. He struck out one and walked two. Rodriguez (2-1) suffered the loss. He surrendered seven runs in 1.2 innings. The right-hander gave up eight hits, walked one and struck out one. The Captains have two games remaining in the 2018 season, both of which will be day games. The penultimate game of the year is scheduled for Sunday afternoon with a 1:30 p.m. first pitch at Classic Park.